I'm bored and these sounded cool in my crazy little noggin. Edited by ZeroTigress, 01 August 2010 - 04:13 PM. I'd buy a selection of real life Drroping Hats. Especially the Shadow of Morroc one. I can see it now. "I'LL MAKE MY TRASH CAN STRONGER BY THROWING AWAY A CARD!" Some of those sound insanely expensive to manufacture. XD Of course, I'd still love a custom figure or something as a wishlist item. Just in case they're ever looking for merch ideas for iRO though, I might as well add some wishlist items as well. A huge world map poster would be fun. IRL versions of cute hats/gear would be fun also. Edited by morphine, 01 August 2010 - 03:01 AM. now that you mentioned it, i wouldn't mind shopping for RO costumes this halloween. I guess that is kind of a lot lol. I want a Soul Linker figure please. I want a deveruchi beanie, I need to buy one. This would be cute. And not too bad, I guess the biggest issue would be the question if they should provide headgears or not (which would obviously make it more complex.). 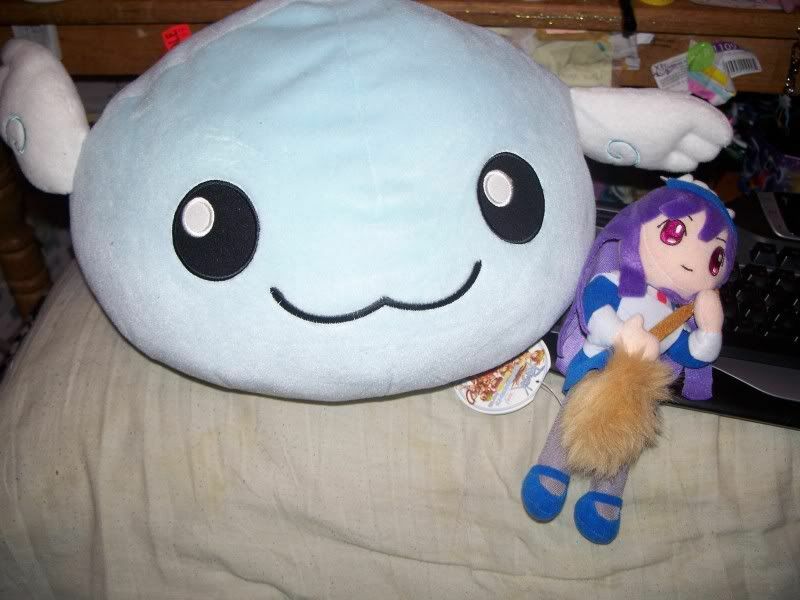 I've always wanted more Poring plushies, etc. Oh, and cell phone accessories. Theres quite a bit of RO merchandise that exists that we have a lot of trouble getting our hands on. Edited by Katreyn, 01 August 2010 - 08:47 AM. So much of it is Japanese-only. I demand merchandise the next time Gravity has a booth at AX. Or at least have an online store connected to WarpPortal. Holy crap, how cool would it be if they sold RO merch in the Kafra Shop? I know where all my points will be going to. RO Monopoly game, instead of building houses, you build barricades, and whenever the opponent encounters your barricade, they must spend lots of money if they want to get past it. I've never understood why we don't have an official RO card game. A lot of the in-game card art would work just fine on actual cards, so that lowers development costs. Card games may not be as huge in the US as they are in Japan and Korea... but they're still pretty popular - I went to an MTG tournament last year with over 400 participants - and it was a tournie for the less popular of the 2 formats (sealed). In addition to being an extra money source for Gravity, it's also a great form of advertising - "so, what's the Ragnarok thing this card game is a spinoff of anyway?" Poring pillows would be awesome. Also, I still love my poring piggy bank I won in a raffle forever ago. Something about a poring doubling as a piggy bank is awesome on multiple levels. They should bring those back, because other than to the handful of players they randomly selected in that event, I don't think they've ever offered those directly. Maplestory has a card game. idk if anyone plays it, but it's advertising! I had to look up Roombas because I'm oblivious like that. That actually makes perfect sense, considering Porings are the ultimate vacuum cleaner (with dogs a close second). I think WoE elements would be much better suited for a war strategy board game. Call it War of Emperium, buy the box, paint the figures, and let the nerdiness take over. If they ever do release real-life replicas of in-game cards, I imagine they'd be as popular as the Cardcaptor Sakura cards. Which is not very. Those Clow Cards are balls rare now (at least the Japanese ones are) and fetch a good amount of money (iirc). A full set replica for RO would be huge. and then outdated pretty soon. TELL ME WHERE I CAN GET THOSE.